Practical training that improves the total warehouse experience. At Hooper Handling, education and training do not only encompass the operator of a lift truck, but also the people in the environment around the truck — the pedestrian. 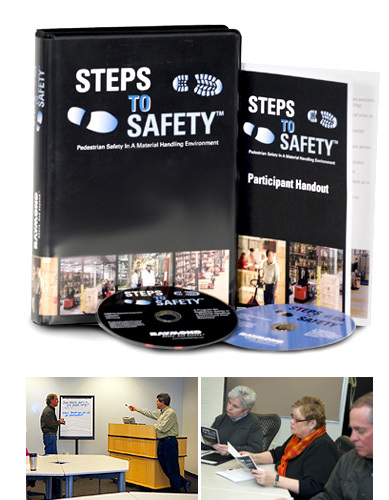 Created by The Raymond Corporation, Steps To Safety™: Pedestrian Safety in a Material Handling Environment is the only training program that assists an employer in teaching pedestrians how to act responsibly in environments where lift trucks are operated, thereby helping to create a more secure, productive environment. In this program, pedestrians learn concepts and behaviors to prevent injury, and gain environmental awareness and visual communication skills. The result of cumulative Raymond Sales and Service Center insights on practical experience in the field, along with customers input, Steps To Safety encourages the application of the principles explained in the program to specific business environments and material handling processes. Steps To Safety can be used independently or as a complement to Raymond's lift truck operator training program, Safety On The Move™, as well as any existing operator training programs. For more information about our pedestrian training programs, please contact us today.